Not every home renovation is a blank slate. While some clients come to us with dreams of complete demolition and starting from scratch, others are more interested in updating a home that they already love. This was the case when we began work on Haley Dugas’s home in East Dallas. “My house was built in the 1930s. It’s a Tudor-style house and we wanted to stay with the more traditional style to match the house,” said Dugas. From the start of the renovation, Dugas felt comfortable and relaxed with Blackline Renovations design-build approach. “From the very beginning, they were very detailed with the whole process. I knew exactly what would happen, and the order it would happen in. We got to meet with all the people who would be working on our home- the architect, designer, the project manager, everybody. Chris and his team kept me very informed throughout the process,” said Dugas. Despite her desire to keep the Tudor-style of the home, she still had big plans for the renovation. The project included a kitchen remodel and a full master bedroom ensuite remodel. During the kitchen remodel, we had to work hard to incorporate the updates that Dugas wanted with the Tudor-style architecture. 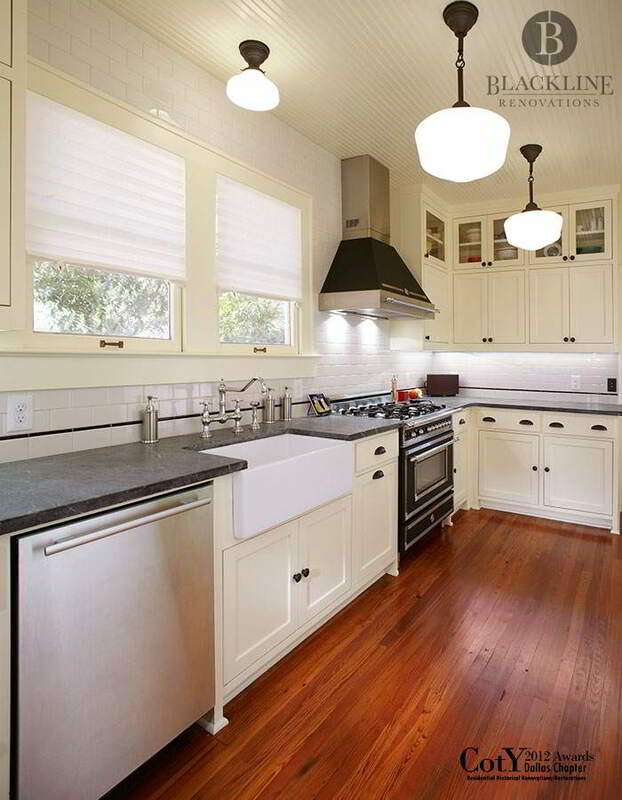 “They actually gutted the kitchen completely and redid pretty much everything. Blackline changed the entire layout of all of our appliances, moved walls, and changed plumbing. Still, they were able to mirror the curved walls and entryways in the rest of the home. It was so important to me that we include those little traits to keep with the style of the house,” said Dugas. The master bedroom also got a major upgrade during the project. Prior to the renovation, there was only one small closet and a pocket door that led into the bathroom. We actually increased the size of the master bathroom by taking some space from the bedroom that was not being utilized. We also created a walk-in closet and added in a make-up vanity and regular sink vanity. Finally, we removed the tub and installed a shower, instead. Throughout this extensive remodel, Blackline Renovation’s commitment to communication kept the project on time and on budget. “There were, of course, a few minor hiccups, but they didn’t slow us down,” said Dugas. When it came time to pick out fixtures and make other budget decisions, there was a bit of flux. “Honestly, I did not stay on budget, but really, I didn’t expect to stay on budget. I knew that I would go over,” said Dugas. Rather than conceding some must-have items, Dugas chose to increase her budget and get the features she really wanted in the home. Due to the detailed budget planning that happened at the start of the renovation, it was easy to for Dugas to see where she wanted to spend her money and where she wanted to scale back. One item does stand out as a particular unforeseen budget-buster for Dugas- a brand-new HVAC unit. “We didn’t originally include a new HVAC unit in the project, but mine was on its last legs and, really, should’ve been replaced years ago. But while Blackline was working on the rest of the renovations, it died. So, I went ahead and had the whole thing replaced. Thankfully, Blackline was super flexible and able to add this in to the project without extending the deadline,” said Dugas. When asked what Dugas will remember most about her home renovation project, she said she was stunned at how there were never any surprises. “I always knew exactly what they would do. Each week we had a weekly meeting and they would tell me what had happened the last 5 days and what was coming up in the next five days. I knew who would be there and who was coming. I’m the only person I know who has had a good experience with contractors and remodeling,” said Dugas. Historic homes don’t have to stay in the past. With a design-build firm, you can preserve the charm while still integrating in 21st amenities.